When I was a kid, the 1996 Blue/White Viper was the car that got me into cars. When SRT debuted the 2013 Viper in 2012 at the auto show, I wanted one. I put a deposit down Oct 2012 and an order the first day you could in November of 2012. I had never driven, let alone sat in a Viper before. I liked what I saw and I liked that CEO Ralph Gilles was a real car guy and passionate about his brand and it sold me. Sad to say, last Monday I canceled my order. A few factors went into this. Communication was perhaps the biggest problem. I fully understand that ramping up production on what was a 'dead' vehicle would have its issues. My dealer told me that I should have the car built in February and get it in March. Well, it is the end of May and VOTS, last I checked, was still production scheduled. I assume the car will be built mid June and in my driveway July, five months behind schedule. (Which, in reality is amusing coming from a software guy, complaining about delays). A simple call from SRT explaining what was going on, would have helped a lot. Some communication from the factory, would have meant the world to myself and I assume others that placed orders. Even just an email saying "hey here is what is going on." More than anything, I got bored with waiting for the car to be built and delivered. I kept waiting and waiting, checking VOTS and seeing nothing happen. I lost the fun of the process. For a toy, losing excitement in it, before you get it, is a bad thing. The lack of communication fed my boredom, it became a vicious cycle. In reality, just waiting was the biggest factor in tossing in the towel. The real poke in the eye was seeing dealers getting custom spec cars, way before those that put deposits down to order custom spec cars. Now, I realize that there are factors into this - SRT can't possibly know that XYZ dealer ordered the car for themselves to sell or a customer ordered it. (Though, that is disputable because VOTS, Chryslers build tracker, showed my name in the order). Again, I realize there maybe legitimate reasons for this - but, being a selfish human being, I simply wanted mine. Even more infuriating than that is seeing dealers get early custom spec vehicles, then dropping $150,000 markups on MSRP. 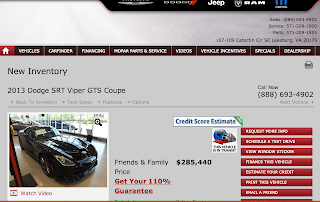 An example is the terrible Dulles Motorcars in Virginia (local to me). 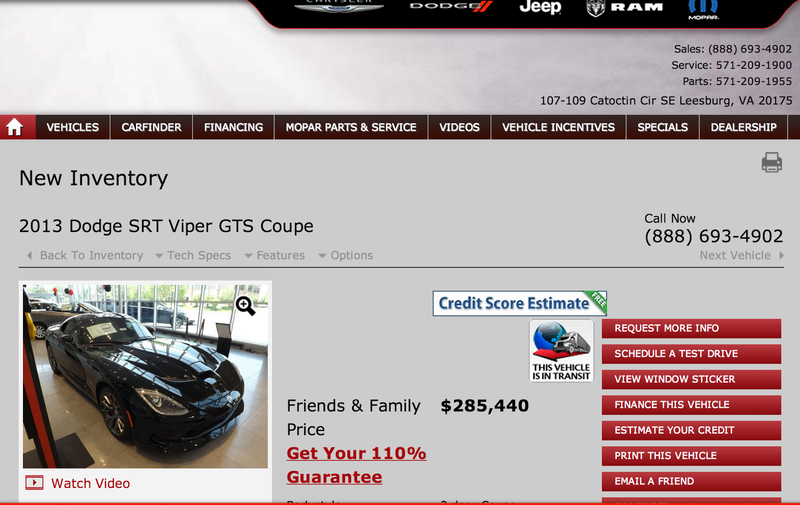 After seeing this, I'll never do business with Dulles Motorcars, ever. It is disheartening, because myself as a customer who put a deposit down, ordered, waited, gets to wait longer while this vehicle goes unsold and collects dust. Gen IV Vipers didn't sell all that great, perhaps these dealers that turned away customers through absolutely moronic pricing didn't help? I wish SRT the best and hope these are growing pains. Maybe I'll look at them again next year. I hope Ralph reads this and takes the feedback. When Motortrend jumped over the Viper last year he took the bull by the horns. Having started businesses myself, feedback is important to success, which I wish the SRT team. Ralph Gilles contacted me almost instantly, asking me how he could get me excited again. As I told him, I think I'll jump back in the line in 2014. I fully understand why there are delays and custom spec cars take time, especially for new production. We are still going to checkout a Jeep Grand Cherokee for my wife here soon, so the brand isn't dead to us! I think I am more disappointed in the dealers like Dulles than SRT itself. (Note, my dealer was fantastic through all of this). It is great to see a CEO that cares about his product!